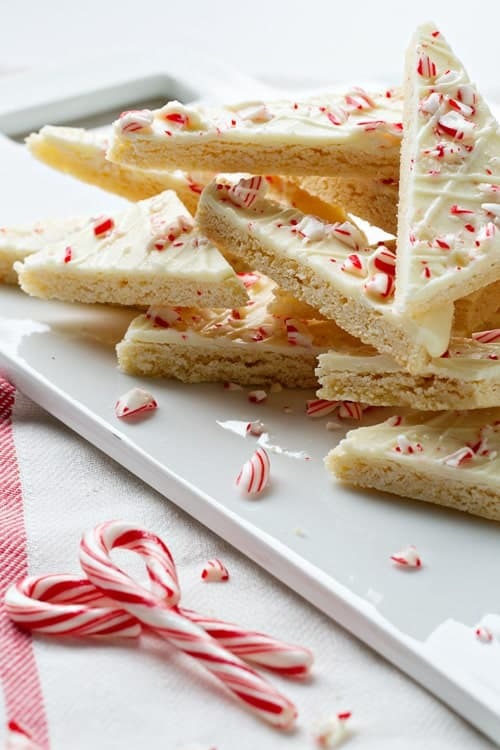 Peppermint Sugar Cookie Bark is a deliciously simple, festive treat. Give it away in holiday tins, or enjoy it at home with a big cup of cocoa! This is a sponsored post written by me as a Get Your Betty On for Betty Crocker’s Holiday Cookies Brand Ambassador. You might have seen me mention previously that Elle is now crawling. Oh boy, is she crawling. Everywhere. All the time. I may have shed a tear or two that her once beloved jumperoo is now persona non grata – she puts on her pouty face if I even wave in its direction. Any sort of containment is actually cause for indignation on her part, including shopping carts. Awesome. So, I decided that maybe we should go the homemade gifts and Amazon route this year. Mama doesn’t have it in her to wander ’round Target finding the perfect gift while Baby Girl has a moment, get me? 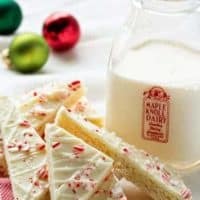 I’m planning big things for all my loved ones, and I’m starting with this Peppermint Sugar Cookie Bark. It’s so easy to make, with the help of Betty Crocker cookie mix. You guys know that I’m an equal opportunity baker. Sometimes you just need a shortcut. And with Betty Crocker cookie mix, you still get that homemade taste, you just get there faster. Homemade gifts have always been a thing for me. I’m well known for my Reindeer Chow and Peppermint Truffles, but this cookie bark may be my new favorite. It’s so beautifully festive, with creamy white chocolate and crushed peppermint candy canes sprinkled all over. 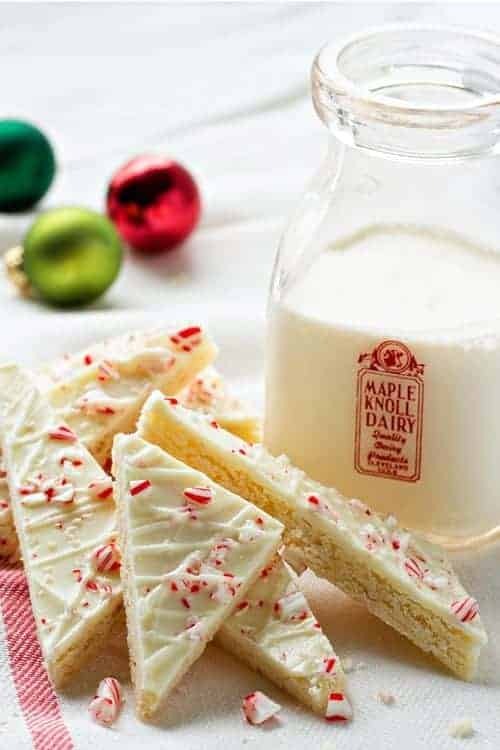 There really isn’t much better than the combination of white chocolate and peppermint. Just ask my stash of Candy Cane kisses. I keep those babies in the freezer all year long, and this bark mimics that creamy, sweet, minty flavor, with the added bonus of a chewy sugar cookie base. Gotta love that. And it couldn’t come together faster! Just grab Betty Crocker sugar cookie mix, butter, an egg, white baking chips, and some candy canes. You could even change the flavor profile a bit using your favorite candy canes, but I’m definitely partial to peppermint. I love all the gorgeous decorated cookies that show up this time of year, but I have to be honest that I don’t have the time, patience or skill to flood royal icing into things. This Peppermint Sugar Cookie Bark looks just as beautiful, in my opinion, with a fraction of the effort. Betty is your go-to for creating simple and memorable holiday moments this year. Betty Crocker’s website is chock full of great ideas, and so are their Facebook page, Twitter feed, Pinterest boards, and YouTube channel. If you’re planning a cookie party with the kiddos in your life (which is a great idea, FYI), you must check out the Betty Crocker “Christmas Cookies with Kids” section of their website. SO many great ideas, you guys. I mean, Chocolate Chip Reindeer Cookies? Yes, please! So how ’bout it? You ready to #GetYourBettyOn with me? We got this, you guys. Even with a mobile baby, we got this gift giving season on lockdown. 1. Preheat oven to 375°F. Line large cookie sheet with foil. 2. In medium bowl, stir cookie mix, butter and egg until a soft dough forms. Press dough into 12-inch square on cookie sheet. 3. Bake 10 to 14 minutes or until light golden brown; cool. 4. In microwavable bowl, microwave white vanilla baking chips uncovered on High 30 to 60 seconds, stirring every 30 seconds, until chips can be stirred smooth. Pour and spread over cooled cookie base. Immediately sprinkle with candy. Let stand until set, about 30 minutes. Gently break up or cut cookie bark. Store tightly covered.